It’s early September, and Andreas Michel – who goes by “Dres,” as do most Swiss men named Andreas, is using the wooden stool his father made for him as a boy to milk his herd of 11 Simmental cows on the Eigeralp in Switzerland. Dres doesn’t speak English, so he doesn’t understand my question of how many generations his family has spent summers with the cows on this Alp, but when he shows me a wooden stool, with his name carved in the seat, and says his father made it for him, I suspect he comes from a long line of Swiss dairyman. I’ve been on a mission since first discovering Alp Cheese 10 years ago to see the tradition in which it is made. I was almost too late. Very few alpine cheesemaking chalets still exist – just six on the Eigeralp above Grindewald. This is a country where hundreds of chalets existed years ago. And quite frankly, the only reason this particular chalet is still in existence is because Dres, a herdsman first, and cheesemaker second, found an executive from SAP – the world’s largest inter-enterprise software company – whose life dream was to become an Alpine cheesemaker. Michael Utecht is 50 but looks 10 years younger. He attributes whey baths to his youthful look. He grew up in a village on the Swiss-German border, and like a lot of city kids, had romantic notions about caring for cows and making cheese. But like most city kids, he went to college instead. Three years ago he was a career communications executive for software giant SAP. Then, remembering his childhood dreams, he took a six-month leave to learn how to make cheese in the Alps. Today, he makes cheese every summer for Dres’ family and lives in Paris the rest of the year, freelancing as a communications coach. “I am fascinated by big cities, but I love to come back to the countryside,” he says. It’s easy to see why. We arrive at 8 am on the Eigeralp, after a harrowing bus ride up hairpin corners and a dozen switchbacks on a one-lane road that the locals use for sledding in the winter. 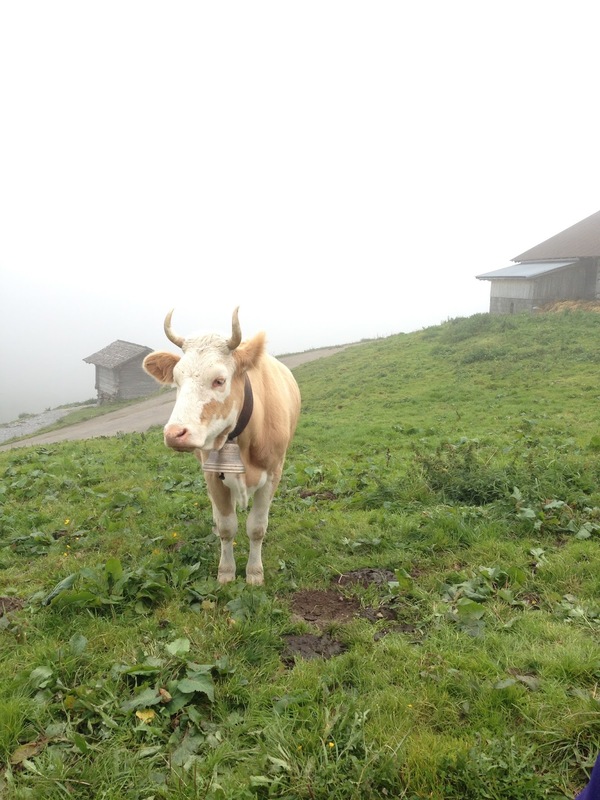 It’s early, and the morning fog is lingering in the air, and the hills are suprisingly quiet – no cowbells in the mist. That’s because all the cows are still in the alpine milking barns. Just five minutes after we arrive, a dozen cows start to slowly emerge from a wooden barn, having just been milked. Their clouds of breath – it is about 35 degrees F – fill up the valley as they emerge to stare at us, I suppose wondering what this group of 20 people is doing on their mountain. Soon, another dozen cows emerge from a nearby barn, then another dozen from another. 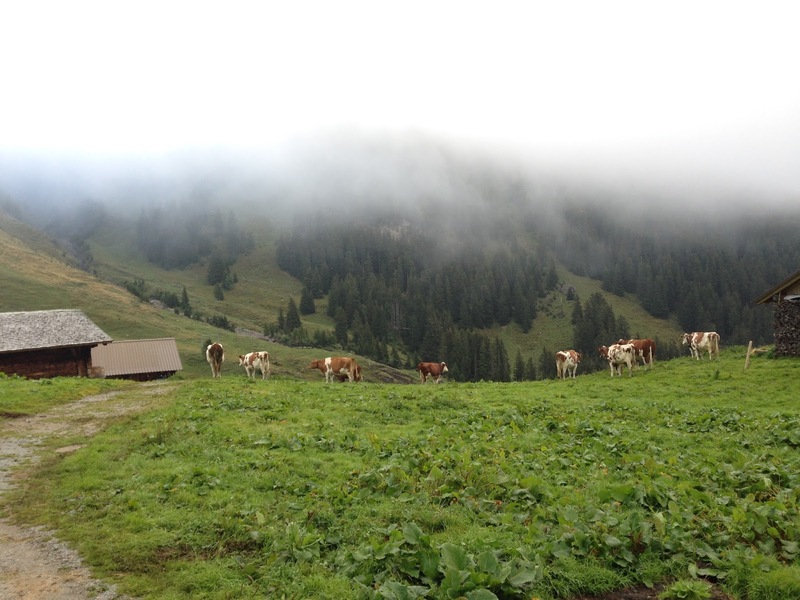 In total, there are seven barns on this alp, each milked and owned by a separate farmer, but all released onto the same alp to graze during the day. Of these seven farms, only three make cheese. The rest contract with the remaining cheesemakers to use their milk. Dres and Michael use only the milk from Dres’ herd – 11 beautiful Simmental ladies with bells as big as melons hanging from their necks. In the morning, it takes Michael and Dres at least an hour to round up their cows for milking. They find them by the bells. Two days ago, Michael and Dres moved the herd to the middle pastures – we are at 6,000 feet. The cows and men spent the early summer in the high pastures – at nearly 7,000 feet, and when the grass from this altitude is spent, they will move to the lower alpine pastures at at 5,200 feet. There is a cheesemaking chalet with attached barn at each level, and the cheese aging hut is built at the middle level. The barn, with attached cheesemaking room. Michael is explaining all of this to us, when Dres yells at him through the window of the barn, letting him know the morning’s milk has been added to the previous evening’s milk, and it’s time for him to get to work making cheese. We follow. 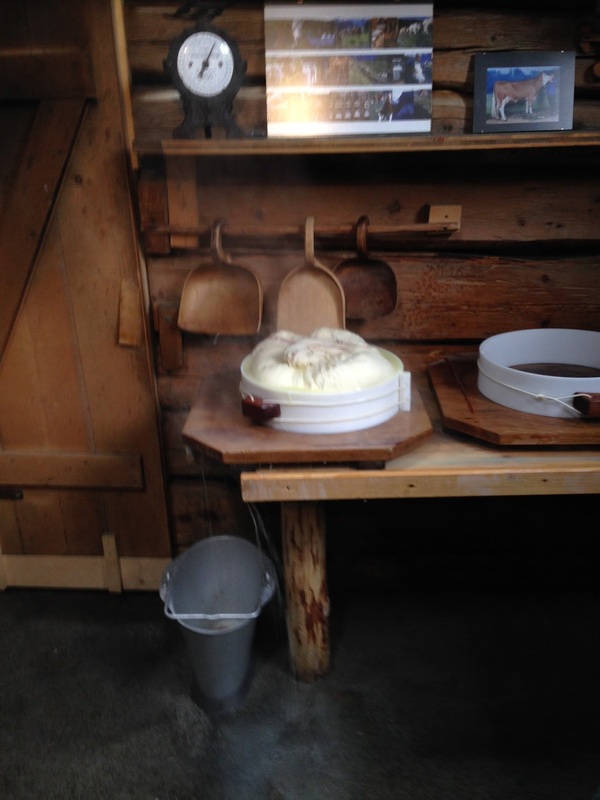 What we find is a traditional alpine cheesemaking hut, with a cauldron over an open fire, and milk beginning to heat. At 86 degrees F, Michael adds the starter cultures, and a bit later, the rennet. Thirty-five mintues later, Dres “rolls over” the curd, and Michael scoops a bit heavy cream with chunks of early curd into a wooden bowl, for all us to try a bit of Schluck (shl-oahk). We use the same wooden spoons Dres and his siblings used when they were younger. Eating Schluck – heavy cream with a few lumpy curds – the morning tradition. The cheesemaking chalet dates to 1897, but parts have been renewed every few years. The roof was last replaced 15 years ago, and the small living quarters – with stove and table – were remodeled two years ago. Meanwhile, the cheese house (where the cheese is aged) dates back to the 1600s – no one knows for sure, because the two numbers after 16 that are carved by the door have rubbed away. Today, we will make only two wheels of cheese, instead of three, and Dres is not happy about it. He had to keep the cows in the barn last night because it was unseasonably cold, and they have not given as much milk this morning as they would have if they had been released to the alp overnight. So the work is less, but the reward also less. It’s time to stir the curd for 45 minutes, and when Dres gets out a small, electric metal stirrer, I pipe up that there are two cheesemakers in the room, and perhaps they wouldn’t mind stirring the curd for 45 minutes. So the modern agitater is put away, and the traditional stirring paddle is washed and sanitized in a tub of steaming hot water near the door. Dres hands the tool to fourth-generation American cheesemaker Chris Roelli, of Roelli Cheese, and Chris begins to stir the mass of curds and whey, I suspect much like his great grandfather did 100 years before him in Switzerland. A few minutes later, cheesemaker Brenda Jensen takes a turn. The rest of us file out to eat breakfast at two picnic tables outside the hut. 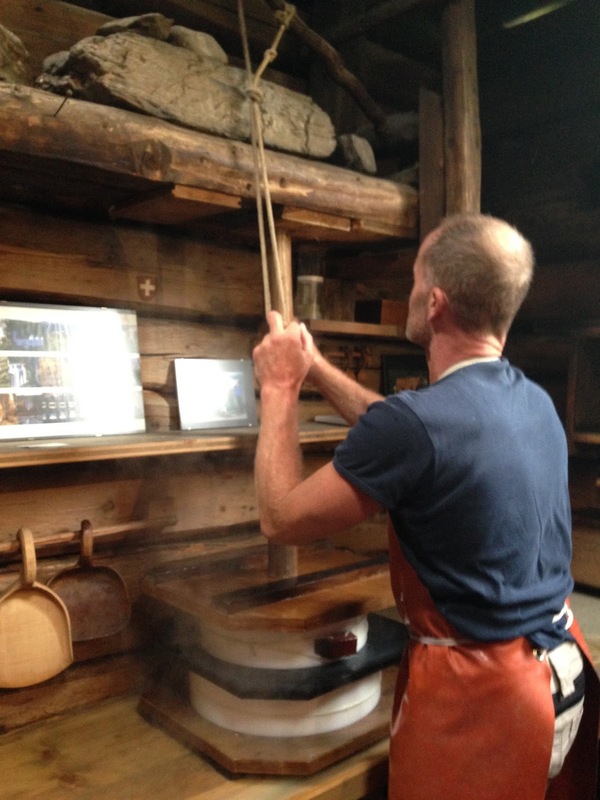 While we’re huddling for warmth and eating homemade bread, jams and yogurt, Dres is cutting the perfect size pieces of wood to put in the fire to slowly increase the temperature to 123 degrees F. Chris and Brenda constantly stir the curd for 45 minutes. grandfather did 100 years ago in Switzerland. takes a turn at stirring the curd. going slowly, raising the temperature of the cheese mass to 123 degrees. 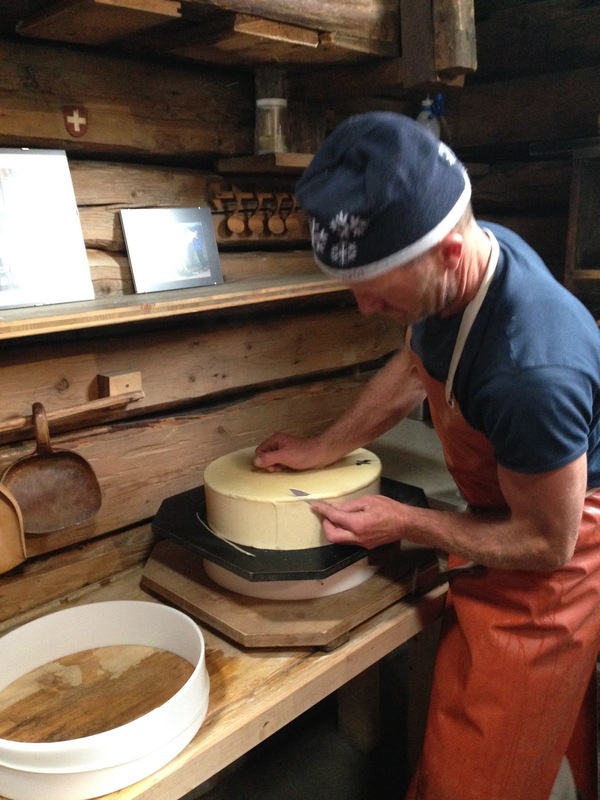 Everything about alpine cheesemaking is a learned art. course, Alp Cheese made by Dres Michel and Michael Utecht. Then it’s time to scoop the curd out of the cauldron with a cheese cloth. Dres is an expert, and scoops out the first batch of curd, putting two corners of the cloth in his mouth, and the other around a metal bar. He bends down into the hot mass and slowly scoops up a bag of curd, wraps up the top, to let some of the whey drain out, and then takes the piping hot mass to a form on the counter. He repeats the process a second time. 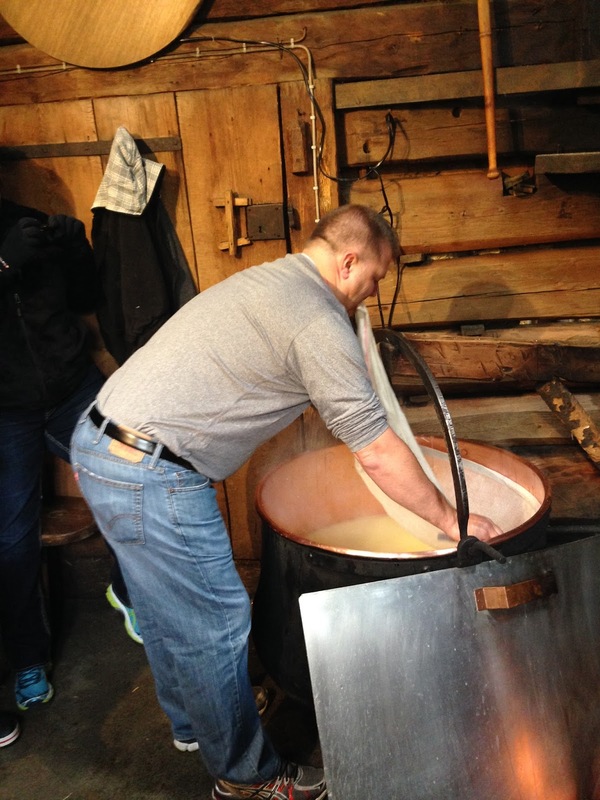 There are just a few curds left in the cauldron, so Michael asks Chris Roelli to scoop them out. This is the second time in his life Chris has done this method – the first was last year at the old Imobersteg factory at the National Historic Cheesemaking Center in Monroe. That time, he went too fast and the curds rolled out of the cloth. This time, on the Swiss Alps, he does it perfectly. ‘This is the best day ever. Ever,” he says. 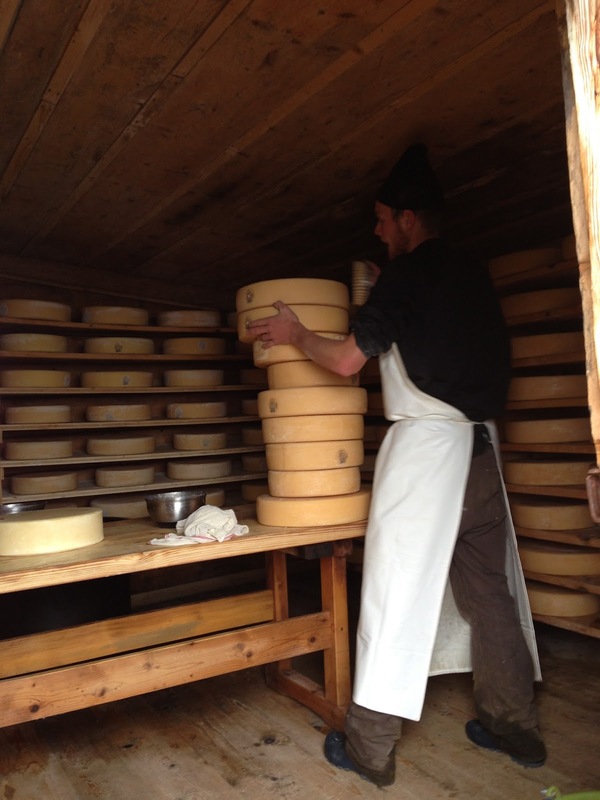 After the cheeses are put in the forms, Dres uses the stone press to keep releasing the whey. Using a press weighted by stones to expel the whey. About an hour beforehand, while we were all busy watching Chris stir curd, Dres had taken yesterday’s cheese out of the press and trimmed the edges. Now that we are done making cheese, Michael carries yesterday’s wheels to the cheese house, where another helper puts them into a small brine tank for 24 hours, and then proceeds to wash and turn 74 days of wheels from that season. It will take him between two and three hours to hand wash each wheel with a brine solution, flip and then put back on the wooden boards. While we are busy organizing a group photo in front of the cheese house, Michael is back at the cheesemaking hut, persuading Dres to play a bit of accordion and yodel for us. 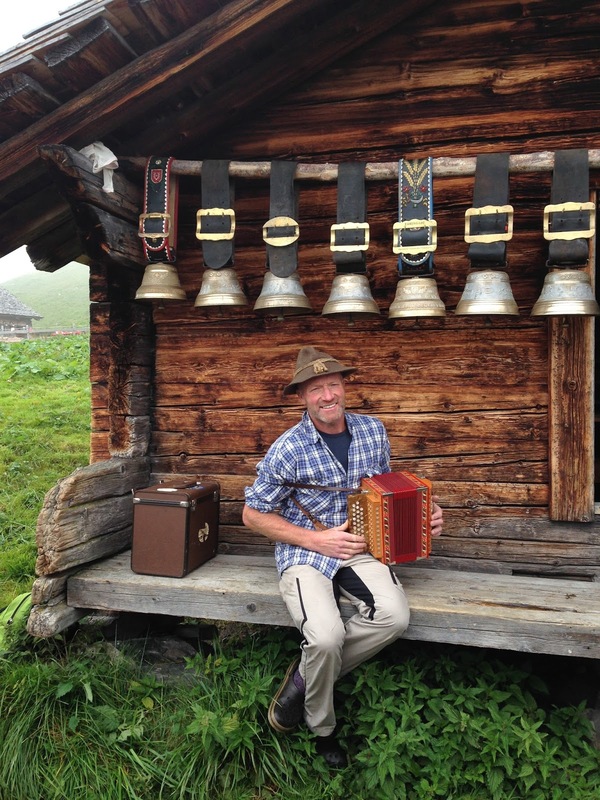 Dres comes down the hill with his instrument, and plays a lovely Swiss song for us, but says no to yodeling. We insist. The man then stands up and sings the most beautiful song you’ve ever heard, in perfect pitch, against a backdrop of cowbells ringing around him. His favorite cow approaches from behind us and begins to beller, recognizing her owner’s voice. It is the perfect ending to a perfect morning. A University of Wisconsin-Madison student aiming to develop his own brand of sheep milk cheeses is the recipient of the 2015 Beginning Cheesemaker Scholarship from Wisconsin Cheese Originals. A committee of industry leaders selected Christopher Eckerman, Antigo, for the $2,500 annual award. As you know, Wisconsin is the only state to require cheesemakers to be licensed, an 18-month process that involves attendance at five university short courses, 240 hours of apprenticeship under a licensed cheesemaker, and passing a written exam at the Wisconsin Department of Agriculture. Eckerman is a full-time student at UW-Madison majoring in Food Science. He grew up on a sheep farm of 200 milking ewes in Antigo. He is a member of the Dairy Product Evaluation Team on campus, and hopes to apprentice this summer in the Babcock Dairy Plant under Master Cheesemaker Gary Grossen. 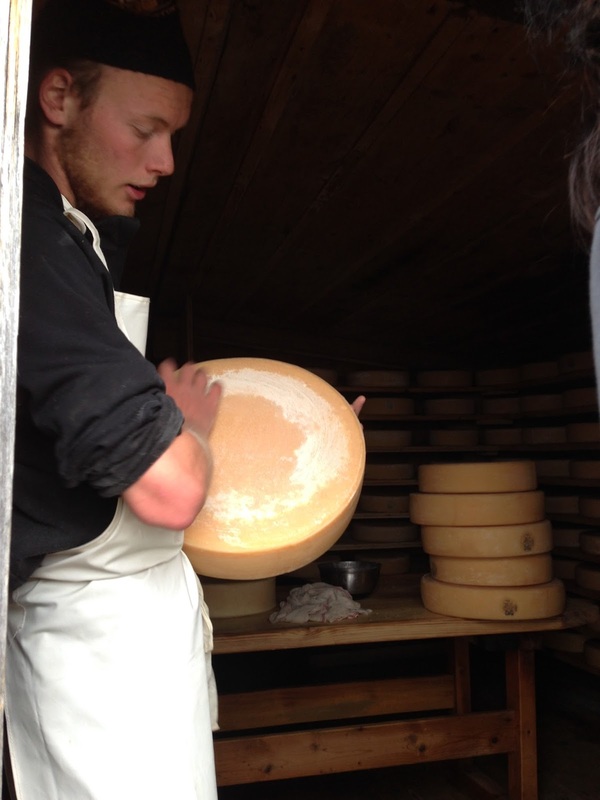 His long-term goal is to continue the family farm and craft his own brand of seasonal sheep milk cheeses. • 2014: Sandra Acosta, dairy goat farmer in Port Washington, Wis. She is continuing to work toward obtaining her cheesemaker’s license. • 2013: Jennifer Digman, licensed cheesemaker and dairy farmer in Cuba City, Wis.
• 2012: Anna Landmark, licensed cheesemaker and owner of Landmark Creamery. 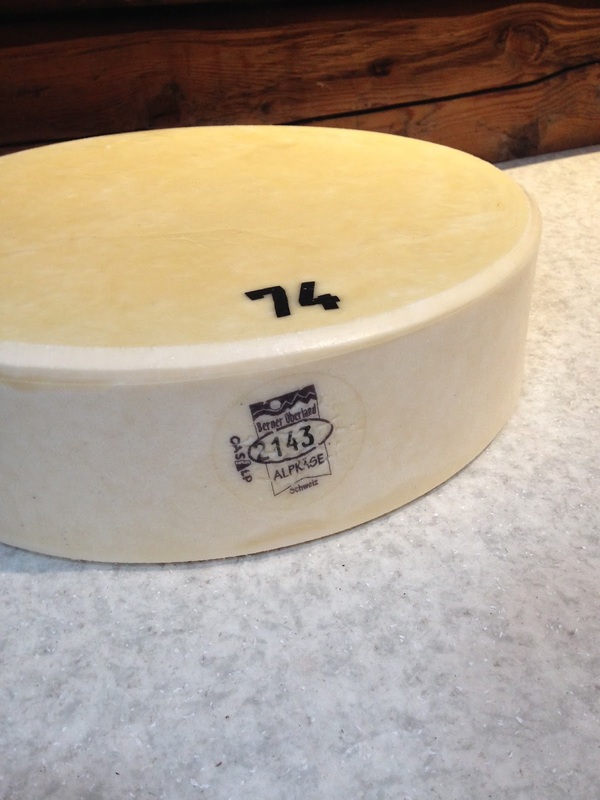 She won a gold medal at the 2015 U.S. Championship Cheese Contest for Petit Nuage, a fresh sheep’s milk cheese. • 2011: Rose Boero, licensed cheesemaker and dairy goat farmer in Custer, Wis.
• 2010: Katie Furhmann, licensed cheesemaker at LaClare Farms in Pipe, Wis. At the 2011 U.S. Championship Cheese Contest, she took Best in Show for her goat’s milk cheese, Evalon, and was named U.S. Champion. Congrats to Christopher – we can’t wait to watch you grow in this industry!